Remington is one of the most trustworthy names in the world of electric shavers. 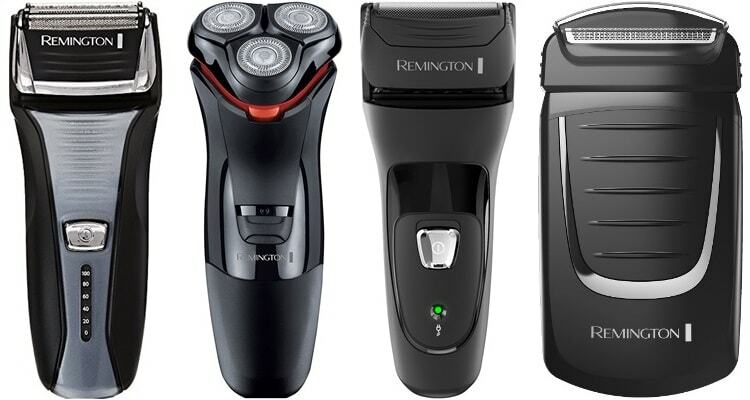 You’ll find many outstanding Remington shaver models that will fit in with your trimming and cutting needs. This guide includes ten Remington shaver reviews to help you see what products the company has to offer. 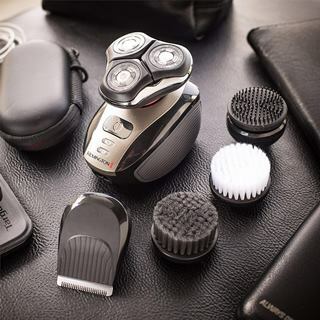 You will find that Remington has many useful shavers that are perfect for your skin and your personal care needs, but you must choose an option that fits in with your specific shaving demands. Why Should You Choose a Remington Shaver Over Other Brands? The Remington F5-5800 is a foil shaver model. It is a dynamic shaver that cuts closer to the skin without producing irritation. The F5-5800 is a foil shaver that features a dual-sided lifting bar in the middle. The bar will lift hairs so they can be cleanly trimmed without pulling on them. The two foil guards on the sides of that bar operate independently and will flex carefully to create a more comfortable shaving surface. A small pop-up detail trimmer is included on the side. Push the trimmer bar upward to produce a guide space that helps you with trimming your sideburns or when you’re trying to produce a more distinct effect on your hair. The rechargeable battery offers about 60 minutes of run time on a full charge. The charge will provide you with about 20 days of daily shaving in between charges. A battery power gauge lets you know how much of a charge you have left. A five-minute quick-charge feature also helps you to get enough power for one shave in moments. I found the physical body of the shaver to work quite well. The grooved handle surface helps me keep a tight, close grip on the shaver. The grooves are right above the power button. The Pivot & Flex feature is one of my favorite parts of this shaver. The shaving head bends and flexes well to keep close contact with my jawline, neck, and other sensitive spots. This provides me with a much cleaner shave than what I would get out of a traditional shaving material. The Intercept system around the foils was also helpful. The pre-trimming setup cuts my hair by a small bit before the rest of the blades can get through. The feature gives me a cleaner cut. The shaver is easy to wash off under my bathroom sink, but it does not work all that well when in the shower. You have to be cautious when using it in humid conditions. The most appealing features inside the R5100 are the titanium blades. The blades cut through hair in moments while keeping each hair even and steady. 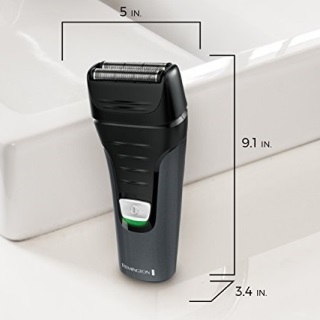 The rotary shaver uses three PrecisionPlus heads that use titanium blades. There are two tracks of blades in each head to create a steady and fast cut all around. A few slots and holes are laid out around the shaving heads to allow shorter bits of stubble to be cut alongside longer hairs. The design even comes with a pop-up trimmer. An anti-microbial compound is added around the blades to keep the trimmer clean. The surface prevents the development of bacteria, thus ensuring the cut being produced is even every time. The Active Contour feature on the R5100 provides an elongated pivot point. The design keeps the cutting heads together to produce a closer trim around the neck and chin among other tight spaces. The rechargeable battery lasts for 60 minutes on a full charge. It takes about 90 minutes to get the battery charged up all the way. A five-minute charging option is also included for helping you get enough power for one charge. The lightweight body of the R5100 was a feature that I liked. The shaver is a little under half a pound in weight, thus giving me more control over the shaving experience without feeling fatigued when I am trying to use the shaver. The comfortable design was particularly helpful in giving me extra control over how I can get a good shave moving along. The contoured layout helps me with getting a better cut all the way through. The smooth surface on the handle also helped me with keeping a better grip on the shaver so I could get a good cut moving all the way through. It was not too hard for me to get the shaver to move along my face without lots of obstruction. Although the three blade heads are flexible, I felt that it takes a bit of effort to try to get them to move evenly at times. The blade heads could be a little looser. Remington makes the HF9000 in its Heritage Series of products. The classic design can be immediately noticed, although there is more to this model than just a classy style. The Lift Logic Shaving feature is an attractive part of the HF9000. The three foil heads operate at different patterns to capture hairs in many directions. You can use this on all your hair without being too hard to cut. The foils can also lift hair quite well so you will get an even cut every time without having to pass over your skin far too many times. The shaver works with wet and dry shaving needs in mind. You can use this alongside shaving cream to create a softer surface on your face to simplify the shaving process. You can rinse the shaver off under your bathroom sink to get it cleaned off. The shaver works with both corded and cordless options. The battery lasts for about an hour on a full charge. The battery will not drain faster if you shave while using foam or gel; the power output is consistent all the way through. The foil heads on the trimmer were very comfortable on my skin. I love how this classic model offers foil heads that bend and flex well along my face to create a better cut. The pop-up trimmer feature on the side intrigued me quite well. The trimmer lets me get through my sideburns in a few moments. I do not have to spend lots of time cleaning off the shaver. The trimmer does not need to be brushed out. The trimmer keeps on working even after I add lots of water to it when washing it off. I wouldn’t use it in the shower, but it still works quite well for most of my general shaving needs. The physical body feels too blocky. It is a challenge to get the shaver positioned at the right angles on occasion. At least I don’t have much trouble with accessing the power knob. The Remington XR1410 uses the unique Verso system that includes 5 different attachments for your grooming needs. I love how well the Verso system lets me take care of several trimming and cutting functions. The design uses many attachments that help you with every step of the shaving and grooming process. The Verso system uses a distinct design that goes alongside a pivoting head. You can remove the pivoting head and add one of many Verso attachments. These include a ten-length adjustable comb trimmer for sideburns or neck tapering, a scrub for cleaning off the skin, a cleansing brush with softer bristles, and a prep brush that exfoliates the skin before you shave. The multi-part approach provides you with a thorough plan for getting your hair trimmer ready. The shaving heads used by those models are basic models that are easy to apply and affix on the base. You can use the shaving heads to cut through hair; the flexible heads provide a better grip around your face for the closest shave that you can get. I enjoyed using the shaver in the shower. The WETech body provides a fully insulated surface that allows me to use the shaver while showering. The shaver will not stop working or slow down because it is wet. It does not take much for me to switch from one attachment to the next. The brush features are also easy to clean off. I can use various soaps and foams on the brushes, and they will not gunk up with lots of stuff on them. The pivoting head is also comfortable on my skin. The blades on the pivot heads are evenly organized and will not tug at my hair. These also do well with lifting the hair before it is cut. It takes about four hours to charge the battery. After that, the battery lasts for 45 minutes before it stops working. A quick-charging option would be appreciated for my convenience and use. 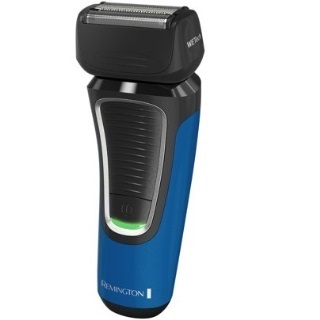 The PF7500 F5 is a Remington shaver designed with comfort in mind. This is due to the contouring features of the foils. The ConstantContour system on the foils will flex based on how you move the shaver. The foils bend along the skin in moments based on the facial contours they are on. This gives you a clean cut every time. The riser bar in the middle also helps with lifting the hair so it can stay straight and even when being cut. The bar reduces the risk of irritation, burns, and ingrown hairs. You can also use the Pivot & Flex feature on the shaver to control how well the shaver bends along your skin. The design keeps contact around the chin and jawline without leaving any empty spots. The detail trimmer pops up on the back part. The blades start working after you open the trimmer up all the way and you turn the power on. A grooved body is found near the power switch. The rubberized design gives you a firm surface that you can keep your fingers on. I was surprised with how fast the battery can charge up. It takes two hours to get the battery charged all the way. After that, the battery works for about 60 minutes. A five-minute quick-charging feature is also included to give me power for a single shave in no time. The flexible foil surfaces were easy on my skin. I can move the shaver along my skin quickly and comfortably in moments. The pivoting head moves gently and does not cause me to lose control. The head moves in all directions and keeps the rate at which I trim my facial hair consistent. I do not have to worry about slipping up when using the shaver all around my face. I did not notice any particular battery power gauges on the shaver. It would be nice to know how much power I have left when I am getting a full shave. The F2-3800L shaver is a foil shaver that uses strong surfaces that make it easier for you to get around more spots on your face. The shaver can trim hair evenly and carefully to produce a comfortable surface for your grooming demands. The Flex Foil feature offers a good surface for trimming. The foils are spaced to where the first foil will trim hair closely while the middle part stretches the skin by a small bit. The skin is stretched out so the second foil will get a little closer to the end of the hair. The design produces no irritation or pain and ensures the hair being trimmed will be cut out as evenly as possible. The steel blades on the trimmer are also made with surgical steel materials to create the best and most even cut possible. The Pivot & Flex technology feature also gives me more control over the trimming process. Pivot & Flex works by getting each foil to flex on its own. The design goes evenly along the skin and handles trimming functions in moments. A small pop-up trimmer is also included for your convenience. I found the blades to be very effective on this shaver. The surgical steel material ensures that I can get a firm cut every time I use the trimmer. The foil surfaces are also easy to clean off in the sink. I did not feel any irritation when I was using this shaver. The design went along my skin quite well and did not produce any pain, nor did it tug on my skin and stretch anything out while I was using it. This was helpful for giving me a better cut all the way through. The lightweight body on the shaver is another point that I liked. The slight grooves on the sides also helped me with keeping a firm hold on the shaver. It takes about sixteen hours to get the battery charged up on this thing. That just seems like far too long, enough if the battery does last for a while on a charge. The R4000 is a rotary shaver that features a distinct black and red body. But the most important part of this shaver is the way how it cuts through hair with precision and by collecting more hair at a time. The PrecisionPlus cutting system uses rotary heads that have slots and holes in their bodies. These are spaces that help gather more facial hair. Long hair can be collected and trimmed in moments. Short stubble can also be covered by the smaller openings all around. The spots on the three rotary heads are kept even from one another to produce a clean and smooth cut every time I use this model. The fully washable shaver works for about 50 minutes on a single battery charge. The PowerFlex 360 feature also helps with producing a better angle for cutting. 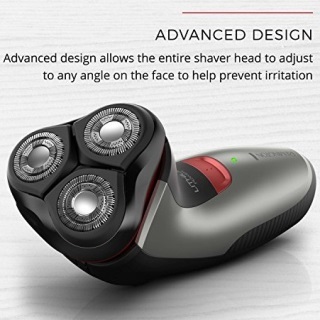 The design allows the shaving head to bend and rotate in many positions to the user’s liking. Don’t forget about the small pop-up trimmer found on the back end to help you with handling your sideburns or other thicker bits of hair that you need to trim. The comfortable handle on this model was my favorite part. I can use the handle in either hand and get a good hold while positioning the rotary heads on my face with ease. The cutters are also linked well with each other to produce a clean cut every time I use it. The cut on this shaver is smooth and close to my skin. I can use this to quickly clear out the coarsest hairs on my face. I found this easy to use around many of my facial curves as well. I did not struggle with trying to get the shaver working, nor did it slow down when it got to some of the thickest spots of hair on my face. The shaving heads can become clogged sometimes. I need to use a brush on occasion to get rid of some of the small bits of hair that are stuck all around. You can use the PF7300 F3 if you are looking for a Remington shaver that does not produce lots of noise. This model has a sturdy body that keeps it working without bothering anyone else in the house. It has some unique technical points that will help you keep a better grip on the trimmer. The PF7300 F3 uses a QuietDrive motor that is engineered with fewer moving parts. The design is quieter than prior Remington models. The sturdy and insulated body also keeps the motor covered to keep vibrations from developing when the power is on. The ergonomic handle is comfortable with a few grooves on the top part. You can fit these grooves in between your fingers to give yourself a better shave all around. The two cutting foils flex independently from one another. There is also a slight curving feature around the shaving top that lets you pivot the foils at various angles. The pop-up trimmer on the back side is also closely hidden and provides a firm cut every time you use it. My favorite part of this shaver is that it offers a lightweight body. The shaver is about half a pound in weight, thus making it easy for me to carry wherever I go. The handle also has enough of a curve to help me hold it without struggling to position it right. The design works in either hand, thus giving me enough control over both sides of the face. I appreciate how the shaver does not vibrate all that much when I use it. This feature helped me with taking advantage of the powerful twin foil system. Speaking of which, those foils also went along my face quite well and were capable of giving me a solid cut every time I used it. The battery only works for 30 minutes on a full charge. This total is around half as much as what I can find on other shavers from Remington and could stand to be longer. Some people prefer to get their shaving done in the shower. The PF7600 F8 is a useful choice to have when you’re looking to get a clear shave going while in the shower. The PF7600 F8 uses a waterproof body for your protection and convenience. The WETech body works well in the shower, but it can also be used with shaving gel. You can apply shaving gel or foam onto your face, and the foil trimmer will still work. The Intercept Shaving Technology feature fit in between the two foils to pre-trim hair before it goes through the main cutting space. The Pivot & Flex head also provides a sturdy body that will adjust itself with use and give you a clean trim every time you use it. The strong battery on the inside provides you with 60 minutes of power on a full charge. The charging plug is easy to access and will not wear out even when you use the shaver in the shower. Of course, you should keep the shaver unplugged from the charging unit when you’re in the shower. My favorite part of this shaver is that the handle offers a slightly rubberized grip that has some grooves to keep it in my hand. I will not lose my control of the trimmer even as it gets wet. The comfortable body on the trimmer gives me the extra help I need with getting a clear shave going every time. Also, the shaver uses a good series of foil guards to help me move the shaver head over my face without irritation. I found the rising bar in the middle part useful in helping me to get a clean shape without the product causing irritation as I used it. The power button was also very responsive. I can gently press it to turn the unit on or off in moments to give me more control over my shaving experience. The foil cutters are tough to clean out. They also need to be replaced every few months so they shaver can keep on working well enough for my cutting demands. The last choice you can look at for your shaving needs is the TF70CDN. 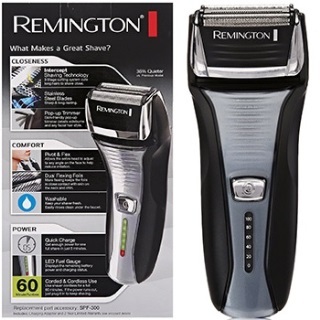 This powerful Remington model offers a series of sturdy blades that will go through the hardest to trim hairs on your skin. The TF70CDN uses a series of surgical steel blades for your help. These blades are kept under two flexible foil covers. The blades are smooth and remain sharp throughout their use. The small body offers a smooth surface with a grooved base for easy control. You can use this in either hand and still get a good grip. This shaver is also different from others in that it operates off of two AA batteries. You can add and remove the batteries in moments. Those batteries will not wear out or short out when you get the shaver a little wet. A travel lock is also included on the body. You can twist the lock switch to ensure the shaver will not turn itself on from any added pressure. This is useful for when you’re traveling and you want to bring this with you without causing any pressure. The TF70CDN is interesting to me in that it offers a small body that is easy to grip and use. I can get the unit applied along my face in moments and it will produce an even cut all around. The flexible foil heads were also useful for my shaving needs. The cleaning brush on the inside is built into the unit to help me clean it out with ease. I can add a small bit of water to the surface to help with clearing some bits of hair out of the way, but it is through the strong brush that I found it easy for me to clear stuff out in moments. I have no real idea as to how long the batteries will last on the inside. There are no noticeable power gauge readouts to help me see how much energy is left. 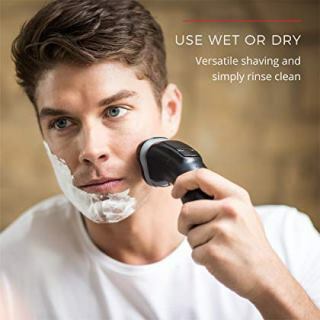 Remington has become a trusted name in the shaver industry for more than eighty years beacuse the company makes shavers that provide close shaves. You can use a Remington shaver to produce a clean shave because the pivot or foil heads on your shaver gets closer to your skin. The lifting mechanism your shaver uses will provide you with extra help for lifting your hair up before it can be trimmed. The blades found in your Remington shaver can be made with one of many materials. Some shavers use stainless steel blades, while others incorporate titanium. But no matter what material you use, you will find that the blades inside your shaver will evenly cut through your hair without leaving split ends or tugging on your hair roots. The risk of ingrown hairs, cuts, or irritation is minimal. While some shavers and trimmers have bodies that are tough to clean off, Remington’s shavers are much easier to wash. You can clean off the head of a Remington shaver by adding it under your bathroom sink. Add water to the head to clear out any bits of hair or shaving foam left in your shaver. Remington makes bodies that are fully waterproof and safe to clean. Those bodies can even be used while in the shower. Most Remington shavers come with built-in trimmers. You can pop the trimmer head up on the back end of a shaver and use that to trim your sideburns or to produce detailed edges or effects on your hair. The trimmer will go through your hair in moments. The feature will also link up to the power source in your trimmer and will start working instead of the standard shaving point on your model. 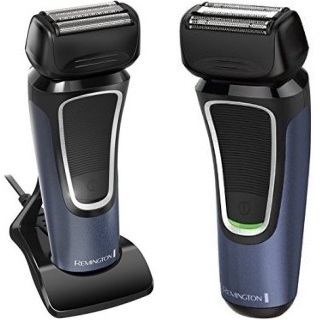 Remington’s shavers come with contoured or curved bodies that are appropriate for left and right-handed shavers alike. Some models feature grooves on their bodies to help you keep a firm hold on a shaver. You will not be at risk of the shaver slipping out of your hand when you hold it correctly. The power button on the shaver is also aligned to be easy to reach with either thumb. 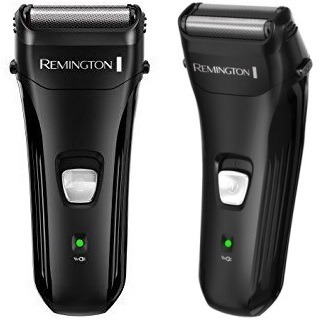 Remington shavers are made with rechargeable batteries that can last for nearly an hour in many cases. The shaver gives you enough power to complete a full shave without worrying about losing power. Some models come with quick-charging features to help you get the battery charged up real fast. You can also use a shaver even when it’s plugged in and charging. This option gives you a consistent flow of power all the way through. The Hybrid Technology system is found in many Remington shavers, including ones in the SF series. The system uses curved foils to cut hair above the surface to keep the trimming process under control. The design prevents irritation while shaving. An aloe vera-coated bar may be included alongside the shaving units to keep your skin smooth and cool while shaving. The Hyper Flex works on pivoting trimmers like ones in the XR line. The full pivoting head can rotate and position itself at any angle along your face. The design allows for more coverage along your face and reduces the risk of irritation. The pivoting heads will also bend along your skin well to provide a closer shave without pulling or tugging at your hair or skin. The F5 and F8 foil shaving series both include Intercept Shaving Technology between their foils. The longer hairs on your face or head will be pre-trimmed before they can go through the main foils. The pre-trimming cuts off a part of the hair to allow the main cutting units to handle the hair with a little more ease. The design provides you with a close shave every time. The F3 and F4 foil shaver lines come with the Pivot & Flex foil system. The head uses a flexible neck around the bottom to help you move the shaver along your skin. The head can reposition itself at many angles to go around your chin, jawline, neck, and other difficult to reach spaces. The flexible body ensures your hair will be cut evenly and that you won’t have to reach around far too much to trim certain areas. Remington has been making quality electric shavers and other personal care products since 1937. The company has been around since the early nineteenth century and has produced various important innovations over the years like the QWERTY typewriter, adding machines, and filing cabinets. Remington’s venture into shavers came in 1937 with the Model E being the first shaving tool the company made. Remington president and CEO Victor Kiam was featured in commercials in the 1970s that made the company popular. He promoted Remington shavers as being capable of getting a shaver to work as close to the skin as a traditional blade. 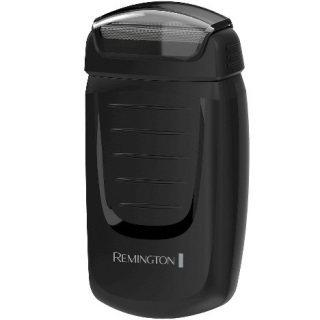 Today Remington continues to work on producing high-quality shavers. The company owns the Clairol personal care appliance business and works with Rayovac to get quality batteries for its cordless tools. Remington is currently a subsidiary of Spectrum Brands and offers shavers plus hair clippers, blow dryers, and personal care mirrors. My choice for the best Remington shaver is the F5-5800. The comfortable design on the shaver and its light weight make it a popular choice for shaving. The lifting bar in between the foil heads helps stick your hair up while shaving. The bending Pivot & Flex head is also great for getting the toughest contours or surfaces of the face shaved every time. You cannot go wrong with any of the shaver models you have read about in this guide. 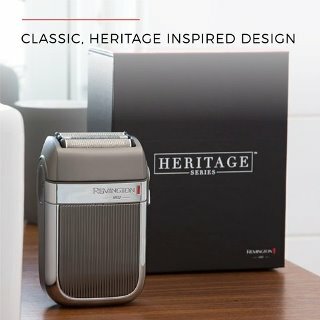 You will need to look at how well a Remington shaver can assist you in trimming your hair the right way. 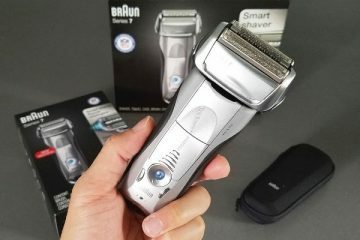 Braun Series 7 7893s: What Makes The 7893s a Powerful Shaver?